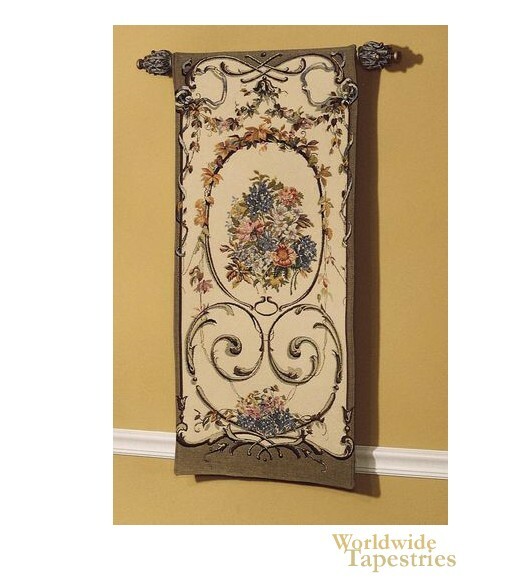 Caroline Taupe tapestry shows a French styled portiere based on the pieces of the 17th century. Here in this work we see a central bouquet of flowers, surrounded by foliage and curved motifs resembling leaves decorating the entire piece. An elegant taupe border surrounds the portiere, which were the long and narrow tapestries which were used to decorate French interiors with designs inspired by flowers and foliage. This portiere tapestry "Caroline Taupe" is backed with a lining and has a tunnel for easy hanging. Note: tapestry accessories, where pictured, are not included in the price.